My Most Unforgettable Marathon (And What I Learned from It). rating scale. Discover this racing opportunity and the City by the Sea. Experts answer readers’ training and competition questions. create one of the world’s toughest and most enduring events—the modern marathon. Real runners never walk during their training and racing. you run faster and farther. Follow our intrepid reporter as he runs 40 miles inside the world of ultrarunning. San Francisco Marathon: A Beautiful Marathon That Can’t Seem to Go Big Time. 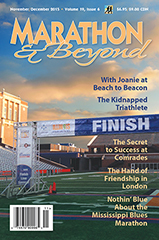 The "Real" 100th Boston: A preamble to our five-article special on the Boston Marathon. How the BAA jumped the gun in 1996 and why they got away with it. best marathoners. As the Berlin Wall fell, she got her chance. Each Boston Marathon, in 25 words or less. The top 13 ways to mess up your marathon debut. My Most Unforgettable Ultramarathon (And What I Learned From It). Fall foliage, Norman Rockwell setting, personal attention. What’s not to like? Where are America’s World Class Marathoners? evaporate. What happened? See what our expert panelists have to say. How do U.S. men and women stack up against the rest of the world? Dr. David E. Martin PhD. U.S. marathons come in all shapes, sizes, and personalities. In joyful defense of very, very large marathons. Part III of this updated version of Ed Dodd’s ultramarathon classic. A race with everything going for it, except the big sponsor. Twenty years ago a runner passed solo from Death Valley to Mount Whitney. to the most godforsaken course on earth. How the exercising body cools itself-or fails to. Learn how to gauge your marathon training and performance with a heart rate monitor. In every race, someone has to be last-even in the Olympic Marathon. A tale of fathers and sons. With the hard training behind you, the last few weeks before your marathon offer opportunities to peak mentally. Payson Weston, whose career was thought to be washed up, competes in the Fourth Astley Belt Race. the world of long-distance running. In a city built on illusion, a marathon that’s down to earth. Twenty-five years ago, Frank Shorter led the way to a "fad"
Twenty-five years ago, Frank Shorter won big in the city of his birth. Running hasn’t been the same since. During the past 25 years, the marathon has grown from sport aberration to institution. Praise or blame these folks. Here’s how to use the marathon as training for your first 50-miler. The rewards of a vegetarian diet are great, but don’t ignore the cautions for success. Square Garden with a record field of 13 competitors. A city trying to reinvent itself puts together a down-home marathon. For two decades Frank Shorter and Bill Rodgers have defined the poles of U.S. running. For 24 years, the Honolulu Marathon has been all things to all runners. The fabled grizzlies that cruise the Jasper Banff Relay course are named anaerobic and altitude. When injury strikes, what’s your first line of defense-heat or ice? A noted U.K coach shares his recipe for marathon success. and Great Britain, as the "Golden Age" of pedestrianism comes to a close.